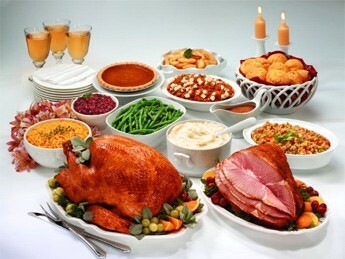 Today is the day after Thanksgiving, a very special holiday celebrated by almost every American every year in November. It’s a time of year that we gather with family, give thanks for everything in our lives, and, of course, eat A LOT! Therefor, I want to share with you a special and hilarious clip from the TV Show Friends. This is a clip from Season 8, Episode 9 in case you want to watch the whole episode later, but I’ve shared this part with you below. Here’s a simple 5-step method to maximize your learning: (1) Watch this clip, (2) Read the transcript, (3) Look at the notes (with important vocabulary, pronunciation, and cultural references), (4) Re-watch the clip for higher understanding, (5) Improve pronunciation and flow by picking a character and mimicking him or her exactly (use pronunciation notes for aid!). Enjoy this fun English lesson! Monica: All right okay, just so you know, I’m not going to make a turkey this year. Phoebe: Turkeys are beautiful, intelligent animals! Joey: No they’re not! They’re ugly and stupid and delicious! Monica: All right fine! If it means that much to you! But just—there’s going to be a ton left over. Joey: No there won’t! I promise I will finish that turkey! Monica: All right, you’re telling me you can eat an entire turkey in just one sitting? Joey: That’s right! Because I’m a Tribbiani! And this is what we do! Monica: Hey, what are you doing? You have got to save room, you’ve got almost an entire turkey to eat. Joey: Let me explain to you how the human body works. Monica: (laughs) This is Chandler’s chicken. This is the turkey. Joey: You are my Everest. I just…I just—I have got to change my pants. Jeans have no give. All right where’s that turkey! Monica: Well Joey, we’re all…we’re all very proud of you. Joey: Whoa—hey—wh-wh-what do you got there? What is that? Pie? Joey: Ah, just cut me a little sliver. A little bigger. Little bigger. What?! Are you afraid you’re gonna run out?! Cut me a real piece! Turkey – A large, flightless bird that is commonly eaten on Thanksgiving. You are my Everest – Joey uses this metaphor to say this is the biggest challenge of his life, like climbing the tallest mountain on Earth might be for someone. 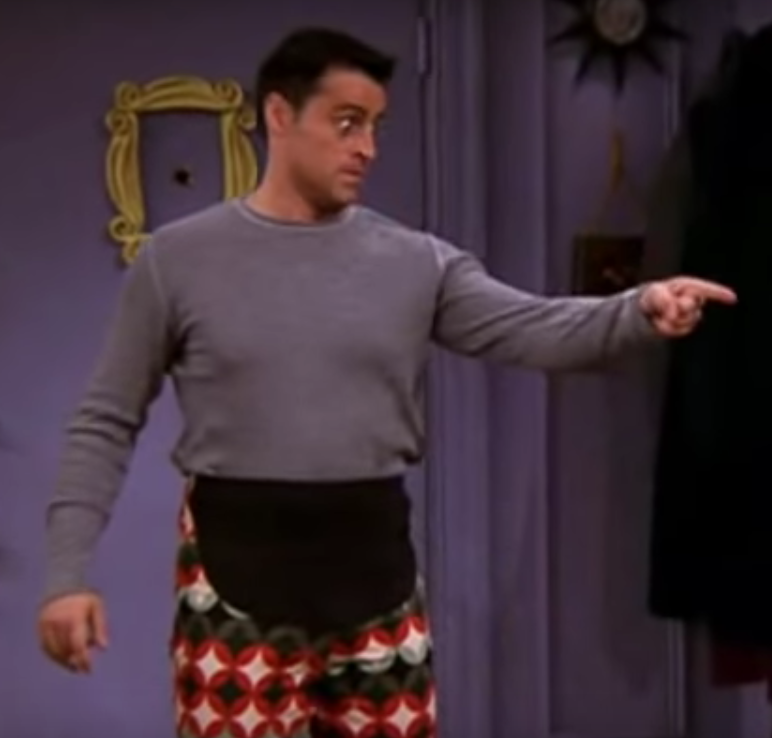 Thanksgiving pants – In the U.S., it is common knowledge that you get very full on Thanksgiving and shouldn’t wear tight pants. 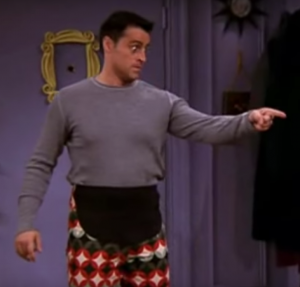 This is why Joey takes Phoebe’s maternity pants as his new ‘Thanksgiving pants’. Expect a call from the president – If you accomplished something extremely grandiose in the U.S., especially something to make the country proud, the President might personally congratulate you. This is why Chandler exaggerates with his typical sense of humor. Did you enjoy this lesson? Please comment below! Let me know what your favorite TV show to learn English with is. Remember that it’s crucial to keep learning English a fun part of your every day life if you want to gain fluency. If this lesson was fun for you, I recommend you check out our popular English course, Fluent with Friends, so you can get fun, interactive lessons like this with full episodes from Friends every week! Learn more here. Loved it, Ethan! It was very educational, so clear, precise and easy to follow. Ahh so sweet of you to say! Super lesson! Fun fun fun! You guys rock! Always having fun and learning with Friends. I love it. Cool. Nice. Funny helpful!!! Thanks! I agree with everyone here, your lessons are outstanding! Congrats! ?